When his wife called him while she was on her way to work at six fifteen telling him to get the camera and find that guy out on the highway pushing a giant ball with a dog he told her she was nuts. He had other things to do. Yard work, for instance. He set about trimming edges and filling boxes with clippings. Hours after his wife called he was roused from his shrubbery-watering by a call from the road. I had taken a scenic route thru his small town. His road went back to the highway. It was quiet, lined with pretty houses. 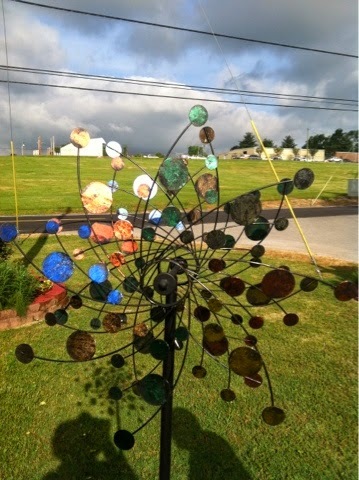 A whirligig in his yard was spinning from the breeze.it sparkled as it turned, I was mesmerized as I walked toward the yard. Naturally, I couldn't help but say something to the man in the yard about it. He would not have seen me, he was too deeply entranced in his yard irrigation to notice anything else. His yard was perfect, the whirligig, though planted prominently in the open space of the yard, looked out of place. Once we struck up a conversation he told me about his wife and chuckled that he got to do his yard work and get the picture she'd asked for. 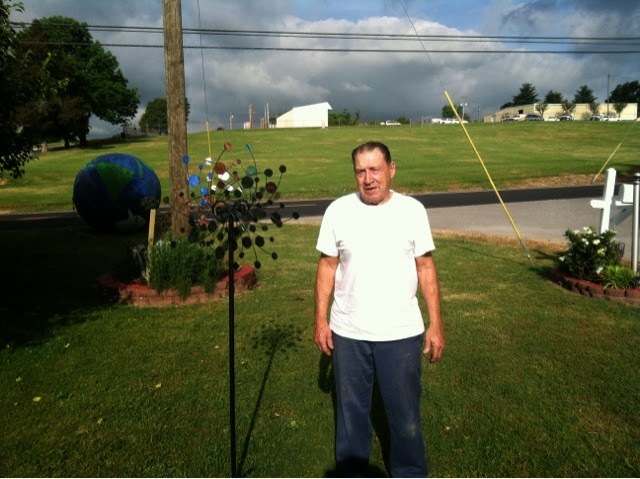 In regards to the whirligig, it was his wife's addition to the yard. Amongst his trimmed edges and painted borders the military veteran showed some disdain for the glistening distraction. It took away the eye from his perfect yard. I asked him to let his wife know he would not have got that picture if not for the whirligig. If you haven't made it too far I'd at least like a picture with you. Someone posted on Facebook about your cause. I'm a diabetic and work at the county park you passed today around lunch on hwy 70.